It seems that the only time serious issues get any attention in New Delhi or Islamabad is when there is a major crisis. But, as soon as the crisis subsides, the issues are ignored or completely dropped. That's what seems to have happened during the last 4 years in South Asia when a golden opportunity to settle Kashmir presented itself. With armed Muslim groups in Kashmir dormant since the post-2004 thaw and President Musharraf of Pakistan eager to make concessions, the world has seen an era of relative peace in Kashmir which has now shattered again. The Musharraf formula envisions soft or porous borders in Kashmir with freedom of movement for the Kashmiris; exceptional autonomy or "self-governance" within each region of Kashmir; phased demilitarization of all regions; and finally, a "joint supervisory mechanism," with representatives from India, Pakistan and all parts of Kashmir, to oversee the plan’s implementation. It is clearly a missed opportunity in South Asia. Land has been at the center of disputes and violence since times immemorial. So it is not surprising that the latest flareup in Kashmir is about land. About 100 acres of land was appropriated by the Indian government on a mountain route leading to a Hindu shrine and given to a Hindu religious trust. This decision was seen by Muslims as an attempt to change the valley demographics and triggered massive protests in the Muslim-majority Kashmir valley. The decision was later rescinded, leading to counter protests in Hindu-majority Jammu. The latest media reports indicate that there have been dozens of civilian deaths. The massive unrest continues in spite of thousands of troops deployed in Srinagar and indefinite curfew imposed. Local media say 15 journalists were among those beaten by Indian police as they tried to cover the protest, despite having curfew passes. More violence is expected as protest leaders say this Monday's rally will go ahead despite the curfew. "They are scared of our peaceful but massive demonstrations for freedom," Mirwaiz Umar Farooq, one of Kashmir's main separatist leaders, told AFP news agency. 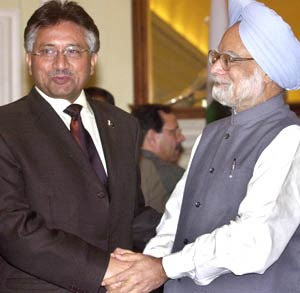 In his December 2006 peace offensive, President Musharraf said that Pakistan could be willing to give up its claim to Kashmir if India agreed to a self-government plan for the disputed Himalayan region, according the Guardian newspaper . With Musharraf no longer in charge, and Pakistani leadership in disarray, it is not realistic to expect Islamabad to play any significant role in dousing the flames and start serious talks on Kashmir. With the Indian parliamentary elections due soon, it is not clear whether Delhi would now be ready or serious about positive movement on Kashmir, even if the leadership in Islamabad were able to engage again. Unfortunately, it seems that Kashmir will return to the bad old days for a while, at least until the leadership situation in both Delhi and Islamabad gets clarified. The crisis is in Jammu..not so much in Kashmir.The problem started with Kashmiri political class opposition to temporary structures on 50 acres of forest land for toilet facilities at 10,000 feet which is inhospitable and the claims therefore by Hurriyat of settling Hindus to unsettle Muslim balance is absolute bullocks.The cancellation of land allotment is the root of the problem which vindicated Jammu people's long standing grievance that they were taken for a ride all along.Further,there won't be any western pressure on India as Geelani wants a Taliban sharia rule in Kashmir and supports groups like Jaish-e-Mohemmad and Lashkar-e-Toiba which had a hand in 7/11 British bus bombings and their cadres are currently fighting in Afghanistan under Maulana Haqqani's militia.The "intefada" in Jammu that led to blockade of Kashmir against Islamist appeasement(like freezing of constituency realignment, autonomy, article 370 etc) have a resonance in rest of India. Secessionism is against Indian constitution.India have sufficient firepower to take down a revitalized armed rebellion if it comes to that. In my opininon Kashmir should just be given independence after all it is what a majourity of Kashmiris desire. You say "Secessionism is against Indian constitution. India have sufficient firepower to take down a revitalized armed rebellion if it comes to that." I'm afraid the bluster and the bravado you express gets in the way of solving any problems and the issues continue to fester and sap the energies of the people of South Asia. Regardless of any outside pressure from any one, it is in the best interest of India and Pakistan to resolve the Kashmir issue. Otherwise, we'll continue to see a repeat of what happened in 2002 when Indian and Pakistani forces faced each other and the US and European companies started to withdraw their personnel from the region. As a result, India had to back down from its misguided "coercive diplomacy". Please read Tom Friedman's "The World is Flat" to understand the implications of the 2002 military face-off along India-Pak border. Riaz: With Musharraf no longer in charge, and Pakistani leadership in disarray, it is not realistic to expect Islamabad to play any significant role in dousing the flames and start serious talks on Kashmir. Are you serious? You're expecting the arsonist to help douse the flames? Without "moral support" from Pakistan - including arming, training and facilitating the LeT, JeM, HUJI and others - this "freedom movement" was DOA. That does not excuse monumental Indian governmental screwups, of course. 1. The "Kashmir imbroglio" usually refers to the Valley. Do people remember Jammu and Ladakh? Who speaks for them? Do the folks who advocate secession bother to check with them? 2. Does anyone remember people on the Muzaffarabad side - who still have no representation. 3. Does anyone remember 500,000 Kashmiri Pandits who were cleansed from the Valley? What of their rights? There are many other questions but I'll stop here. India's policy towards Kashmir smacks of appeasement. If India were more like Pakistan, China or Israel, it would not be hand-wringing at this point. It would have settled 500,000 "plains people" in the Valley the problem would have been rendered non-existent. well bluster and bravado if u call it that is my frustration of separatist appeasement(which supports barbarous and brutal groups like LeT and JeM) by Indian govt.LeT may be an ISI puppet but JeM is a family enterprise of Masood Azar. JeM is closely linked to Al-Queda and is responsible for assassination attempts on Musharaf,daniel pearl killing and suicide attacks in Pak. It is more international in character and is now out of control of Pak army-intel. Hypothetically speaking, secession from India of J&K is impossible for India as the secularism pillar of India will be demolished and will result in backlash against muslims in rest of india. becoz it will be a vindicated example that when Muslims are in minority,they cry about human rights,religious freedom and other phantom threat and mobilize against the state and against other groups.when they are in majority they play by their own game like in saudi,pak and Malaysia(death sentence for blasphemy etc which is misused to settle personal scores). j&k is literally a useless piece of land with terrain best for guerrilla warfare and inhospitable climate at borders requiring ridiculous expenditure to man it. so the point i am making is J&K as an integral part of india.. is itself an idea of india.. which will be shattered with secessionism than anything else. The argument that since kashmir of J&K want to go to pak since majority are muslims is ridiculous. Every part of india belongs to whole of indians not only its occupants. If ppl want to go,they surely can, but the contention that they want to take their seat along with them is outrageous. This time around if Pak intel cannot resist the temptation to fish in troubled waters, remember that yours is a glasshouse too..not in parts..but as a whole. i hope u can sieve the essence from my bluster. It always amuses me to see Pakistani's calling for referendum on Kashmir. It would have been independent like Nepal and Bhutan had Pakistan not sent in the tribals in 1948. Once, Pakistan attacked, Independence option went out of the window. How could India trust Pakistan after that? Wonder why no Pakistani calls for referendum in Balochistan. The only solution now is to convert the LOC into an International Border. Indian Kahsmir would be autonomous. Two other states of Ladakh and Jammu can be created. rajesh: It would have been independent like Nepal and Bhutan had Pakistan not sent in the tribals in 1948. Not true. Vallabh Patel would have ridden rough-shod over Hari Singh of Kashmir, just as he did with about 550 other little princely states. Indian Kahsmir would be autonomous. Two other states of Ladakh and Jammu can be created. Ah - that crazy trifurcation plan. No, the solution is to get rid of Article 370 and fully integrate J&K(&L=Ladakh) into the Indian Union. The appeasement by the Indian state thus far has made these fools in the Valley believe their land is sacred. It is not. Riaz: no time to elaborate, but there is an interesting thesis that Kashmir is not about land at all: it is about water. The Valley is upper-riparian for many of the major rivers that flow into West Punjab and East Punjab. "Pakistan could be willing to give up its claim to Kashmir if India agrees to a self-government plan for the disputed Himalayan region, President Pervez Musharraf said today. General Musharraf told the Indian New Delhi Television channel his country would back wide-ranging autonomy or self-governance for Kashmir, with Islamabad and New Delhi jointly supervising the region. Asked whether Pakistan would be ready to give up its claim to Kashmir, he said: "We will have to ... if this solution comes up." Haq sab, the self-rule was already in the pipeline i.e. except defence and external affairs..autonomy if u call it that. Now that Omar,Farooq Abdullahs and Muftis show their true color by turning peaceful Kashmir with tourists flowing in, back to disorder and chaos. Separatists have a clearly defined agenda,so they can't be blamed..but the democratically elected parliamentarians showing such cheapness for a bunch of votes and chair is outrageous. Instead of clarifying the land use issue,they helped spread rumors of settlements like in Israel. The fact that Muslims in India have a steady high population growth rate is an indication that these claims are utter nonsense. This compare to Pak's Hindu population decline from 20% in 1947 to less than 2% right now is a clear indication that Jinnah's speeches are just that..unkept promises of religious freedom. The future course in Kashmir ofcourse is abolition of 370 and merge it as any other state.The pampering have done its damages at huge cost. I believe the Musharraf proposal envisaged a unified Kashmir with self-rule with India and Pakistan sharing nominal sovereignty over it. Such a proposal would eliminate the LOC and blunt the militants' exploitation of religion in the valley. It would also close an open wound from India-Pakistan partition and minimize the danger of another much more disastrous war in South Asia. Unfortunately, the Indian government failed to seize this opportunity. Its very unfair to blame India for slow down of peace talks. India is pursuing peace talks even amid ceasefire violation,infiltration and an infamous attempt to blow up kabul embassy targeting senior diplomat and defense attache.The talks slowed down and lost momentum due to none of these factors ofcourse. It started to slowdown when lawyer agitation gathered monumental proportions and Sharif assertion that any "sellout"(out-of-the-box) solutions will be reversed by civilians when it comes to power. India was waiting for things to get settle down in Pak and if India accelerated peace talks with Musharaf when his ratings are down, it will obviously look suspicious.Even today leadership roles and power structures are fast evolving.So India rightly directed diplomatic currency to other important projects like N-deal.UPA govt unlike NDA delinked Pak Army's action from Pak people and almost considered army-intel as a separate entity with its own parallel strategic path. The new direction of Indo-Pak peace process is that both the govts have hitherto let the peace process grow in proportion to organic development of people to people interaction, instead of giving the initiative to intellectuals and buerocrats. Riaz: We have seen a significant lost opportunity to resolve Kashmir in the last four years of relative peace and Musharrf's readiness to make huge concessions. Musharraf's proposals may seem like a huge concession from a Pakistani point of view. Problem is these are purely ideological concessions like giving up claim on Kashmir. India would be required to make real concessions being the status quo power. Then there's that troublesome question about what Pakistan would do if India refused (as India did): would it be back to "death by a thousand cuts"? Given the increasing economic disparity between India and Pakistan, seems like all India needs to do is hang on for 10 years more. India will be close to a $3 trillion economy. Being #3 or #4 in the world will allow a unilateral solution to be imposed on Kashmir - all moral grandstanding notwithstanding. So the question for you is: why should India negotiate now, from a position of increasing strength? Status quo is uncomfortable, but much less so than in 1989. Negotiating now would be snatching defeat from the jaws of victory, would it not? You said: Problem is these are purely ideological concessions like giving up claim on Kashmir. India would be required to make real concessions being the status quo power. Then there's that troublesome question about what Pakistan would do if India refused (as India did): would it be back to "death by a thousand cuts"? My response: Pakistan controls more than 1/3 of the disputed territory. It would have to withdraw from it in order for the Musharraf proposed arrangement to be implemented. Is this not a real concession? "Death by a thousand cuts" is likely to come from the continuing unrest with the potential for a new insurgency that would drag India and Pakistan into direct major conflict. Do you think this would be better outcome that what the Mush proposal bring about? Are you ok with the cycle of violence and the history repeating itself? If you are, then I think you are being very short sighted. You are not fully appreciating the cost of continuing conflict for both nations that still remain very poor and unable to provide for many of the basic needs of food, energy, healthcare and education for their people. Riaz: Pakistan controls more than 1/3 of the disputed territory. It would have to withdraw from it in order for the Musharraf proposed arrangement to be implemented. Is this not a real concession? Actually Musharraf wasn't thinking about the Neelam Valley. Here is an interview where he outlines a plan for "joint management" of 3 cities east of the LoC but convulses when asked about a city west of the LoC. I agree with your basic premise that solving this issue should be a very high priority - given how destructive it has been. The flaw - as I see it - in your argument is the assumption that once Kashmir is solved, that India and Pakistan (and an independent Kashmir?) will get along. Much more likely, we'll be at each others' throats that much more. The human and economic costs will go up, not down. In an alternative reality fewer people would have died and much less money expended in an undivided Indian sub-continent than in the current reality. The same logic applies to India and Kashmir. And so, the cynical calculation that maintaining status quo is the best of some terrible options. Musharraf's Kashmir proposal was far-reaching. It was not the final word, but a fundamental change in position for Pakistan. We are discussing it here at this forum in some detail. Unfortunately, it wasn't fully discussed by the powers to be. That is my main regret. It could have been discussed and modified to reach a mutually-acceptable deal, if India seriously responded to it. I believe Kashmir is THE fundamental issue that stands in the way of better relations between the two neighbors that have so much in common. Other issues are much less significant. As a result of this missed opportunity, we continue to face the potential for a devastating nuclear confrontation in South Asia. Let's hope better sense continues to prevail for an eventual settlement of Kasmir and other disputes between India and Pakistan. Riaz: We are discussing it here at this forum in some detail. Unfortunately, it wasn't fully discussed by the powers to be. The Indian power-that-is - the UPA - is probably much more flexible than the BJP (government from 2009?) is going to be. And Pakistan's emasculated civilian administration cannot deliver what it promises. So I suspect, as you fear, that the window of opportunity is closed. I believe Kashmir is THE fundamental issue that stands in the way of better relations between the two neighbors that have so much in common. I respectfully disagree. The Pakistani military - officer cadre - is nurtured and indoctrinated with anti-Indian venom that is the stuff of fantasy. It is, unfortunately, not a professional fighting force any more. It's results - losing every war it initiated - do not stand in the way of it embarking on irrational quests. The Army has a disproportionate impact on Pakistani political life - possibly the dominant force. Kashmir, for the Army, is the Big Cause - its raison d'etre. Should Kashmir be neutralized, this Frankenstein Army will conjure another monster cause to fight the "cunning Hindu idolator baniyas" to justify its importance (I'm not Hindu btw :-) ). I'll stop here - my point is the Army is the elephant in the room that will not go away. You said, "It (Pak military) is, unfortunately, not a professional fighting force any more. It's results - losing every war it initiated - do not stand in the way of it embarking on irrational quests." With all due respect, I think you are repeating the false Indian propaganda about Pak military as an evil bunch of losers. Demonizing and denigrating Pak military will solve no problems between India and Pakistan. With the exception of Bangladesh war, Pak military has held its own against a much larger Indian military with overwhelming conventional advantage. With the Indian decision to go nuclear followed by Pakistan's nuclear tests, the Indians have essentially negated their conventional advantage. So all the bluster and bravado of Indians is now meaningless. The force of conventional arms will not work to their advantage. Unless the Indian leadership and India's people understand this fact very clearly, they will continue to miscalculate, eventually leading to mutually assured destruction. As a student of management, I have learned that the worst mistake one can make is to underestimate the competition. There is still an opportunity for India and Pakistan to shun the path of war and destruction and give the gift of peace and prosperity to our future generations. Riaz, my criticism of the Army was not an assessment of its war prowess alone. It was more about the increasing political space it occupies, and refuses to relinquish. Ayesha Siddiqa makes a very compelling case in "Military Inc" for the Army's destructive effect on the Pakistani economy, polity, and on its own war preparedness. Shuja Nawaz, in "Crossed Swords", gives an insight into the thinking of the Army elite - quite depressing in parts. Snippets from Pakistani generals like this show a leadership that believes they are superior to their Indian counterparts. As for its professionalism, how does one explain away 200+ Frontier Corps soldiers surrendering in Waziristan without firing a shot? Or the inability to throttle that small-time thug Baitullah Mehsud, given that the ISI itself has indicted him for Benazir's assassination? My "bluster and bravado" was anything but. And no-one is underestimating the level-playing-field that nuclear weapons create. But the fact is that the Army needs an excuse to keep funds flowing, and Kashmir has provided that cause. Removing Kashmir will not mean the Army packs up and heads to the barracks. They need to, and will, find another "cause". They have done exceptionally well through real and manufactured conflict. They are not about to give it all up now. They are the biggest impediment to the success of the Pakistani people and the Pakistani state. I quoted several Pakistani sources to assure you that my views are not formed by reading the RAW playbook, or from reading BharatRakshak. Most commentators and pundits have a habit of exaggerating to sell books. But I think we have veered considerably off course in this discussion. The fact that Musharraf, a Pakistani army general, made a bold Kashmir proposal makes all of the arguments against the Pak military irrelevant to this discussion. No one in India (or for that matter, Pakistan) has had the courage to do anything even close. I sincerely believe that a great opportunity has been missed here. Only time will tell how costly this mistake will prove to be. Riaz: But I think we have veered considerably off course in this discussion. Only time will tell how costly this mistake will prove to be. But I absolutely hear you on bequeathing a better tomorrow to future generations. We may not agree on the methods, but the goal is the same. Some 100 acres of land are to be set aside for use by a Hindu trust during an annual Hindu pilgrimage. 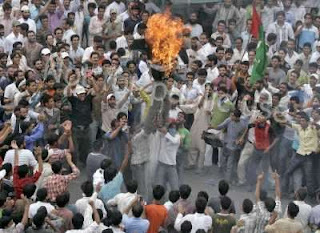 Muslims have expressed anger over the move, with some defying the curfew after Sunday's decision was announced. But Hindus have welcomed the move and called off their protests in the long-running dispute. Meanwhile a senior separatist leader, Shabir Shah, faces up to two years in prison without trial after being charged with activities prejudicial to the security of India. A survey which a British academic says is the first systematic attempt to establish the opinions of Kashmiris has produced "striking results". Robert Bradnock interviewed more than 3,700 people in Indian- and Pakistani-administered Kashmir to assess their views on various issues. One of the key questions put to respondents was how they saw the future of the territory. Nearly half of those interviewed said they wanted independence. Another question asked for their views over the continuing insurgency. Dr Bradnock - an associate fellow at the Chatham House think-tank in London - says that the survey has produced startling conclusions, especially in relation to the future of the territory. It revealed that on average 44% of people in Pakistani-administered Kashmir favoured independence, compared with 43% in Indian-administered Kashmir. "However while this is the most popular option overall, it fails to carry an overall majority on either side. "In fact on the Indian side of the Line of Control [LoC] - which separates the two regions - opinions are heavily polarised," Dr Bradnock told the BBC. The survey found that the "overwhelming majority" of people want a solution to the dispute, even though there are no "simple fixes". Dr Bradnock said that in the Kashmir valley - the mainly Muslim area at the centre of the insurgency - support for independence is between 74% and 95%. But in the predominantly Hindu Jammu division to the south, support is under 1%. * Few are optimistic over peace talks - only 27% on the Pakistani side and 57% on the Indian side thought they would succeed. Dr Bradnock said that it was "clear" that a plebiscite on the future of Kashmir - along the lines envisaged in UN resolutions of 1948-49 - is "extremely unlikely to offer a solution today". "The results of the polls show that that there is no single proposition for the future of Kashmir which could be put to the population... and get majority support," he said. "The poll offers no simple fixes but offers signposts - through which the political process, engaging India, Pakistan and wider Kashmiri representation - could move it towards resolution." Rights group Amnesty International has criticised a tough Indian law which it says has been used to detain up to 20,000 people without trial in Indian-administered Kashmir. Amnesty urged India to scrap the Public Safety Act (PSA) which allows detention for up to two years without charge. The group also criticised the judiciary for its failure to protect human rights of the detainees. Kashmir has been gripped by a violent separatist insurgency since 1989. The detentions have been made since the beginning of the insurgency, the Amnesty says in a new report released in Srinagar city on Monday. Titled Lawless Law: Detentions under the Jammu and Kashmir Public Safety Act documents how the law is used to secure long-term detention of individuals against whom there is insufficient evidence for a trial. "The Jammu and Kashmir authorities are using PSA detentions as a revolving door to keep people they can't or won't convict through proper legal channels locked up and out of the way," said Bikramjeet Batra, Amnesty's campaigner for Asia Pacific programme in India. "Hundreds of people are being held each year on spurious grounds, with many exposed to higher risk of torture and other forms of ill-treatment," he added. The report says the detainees include political leaders and activists, suspected members or supporters of armed opposition groups, lawyers, journalists and protesters, including children. Often, they are initially picked up for "unofficial" interrogation during which time they have no access to a lawyer or their families. Even minors are being held under the law, the report says. Amnesty International called upon the government of Jammu and Kashmir to repeal the law and end the system of detentions. It also asked the government to release all detainees or charge those suspected of committing criminal acts with recognised offences and try them fairly in a court of law. The Himalayan region of Kashmir is divided between India and Pakistan and is claimed in full by both. The region is also one of most militarised in the world with hundreds of thousands of troops present on both sides of the Line of Control - the de facto border between the two countries. SRINAGAR: Just 10 days since human rights activist Gautam Navlakha was deported from Srinagar, the ruling National Conference has asked the Jammu and Kashmir government not to allow senior lawyer Ram Jethmalani to enter Kashmir, saying such a visit would vitiate the “peaceful atmosphere”. He also held the State government, rather than the Centre, responsible for this. After reviving the Kashmir Committee, Mr. Jethmalani, along with Ambassador V.K. Grover and journalist-activist Madhu Kishwar, visited the Valley for five days and met a cross section of political leaders. The party spokesman said people like Mr. Jethmalani, Arundhati Roy and Mr. Navlakha — at the behest of political mercenaries like Madhu Kishwar and the like — visit Kashmir to vitiate the peaceful atmosphere in the State and then return to their comfortable homes in Delhi and Bombay to be seen occasionally on television screens discussing Kashmir with the sole aim of stoking the violence and disturbance in the State. “The government should not allow people like Ram Jethmalani to enter the State during summer. [They] do not want a solution to the Kashmir issue, and instead, come here to misguide the people, hoodwink them, and derail the process of peace in Jammu & Kashmir,” the spokesman said. The party spokesman asked Mr. Jethmalani to first convince his own party, the BJP, to support the reduction of troops' presence in civilian areas as also to raise the demand for the withdrawal of the Armed Forced (Special Powers) Act, before trying to convince others. The Jammu and Kashmir Liberation Front, headed by Yasin Malik, also criticised Mr. Jethmalani. “No doubt Ram Jethmalani is a famous Supreme Court lawyer, but in the political field he is but an inexperienced man. His politics has always been based on duplicity. He has always been pursuing the policy of double standards and there has always been conflict in his words and deeds,” a JKLF spokesman said in a statement. QUOTE: "Given its large size, Kashmir is surprisingly one of India's least populous provinces. Despite being the one the richest provinces in natural resources, its estimated 12 million people are amongst the poorest in the country. While the rest of India is benefiting from Kashmir's hydroelectric and forest wealth, a World Bank report says the northern province has the worst economic growth record, the weakest infrastructure and the lowest national socio-economic indicators. Residents have long complained of being neglected by both the provincial and central governments. The resentment has helped fuel the low-level Kashmiri insurgency that has long battled the Indian state for political self-determination. Separatist Kashmiri leaders have long accused the Indian establishment of manipulating election results in favor of politicians they have created to counter separatist forces. They warn that if those policies are not abandoned the insurgent violence will increase. “So, what we want is a free and transparent elections, mandate should be respected, trust deficit should be defused then there could be a way out to settle the problems [of Kashmir]," they said. Worsening the so-called "trust deficit" between the Indian government and the people in Kashmir are the hundreds of people alleged to have been disappeared in the last several years. Kashmiri activist groups blame the Indian army for disappearances and extra-judicial killings. Indian authorities reject the allegations and instead blame separatist groups for the murders." The repeated calls by various civil society and human rights groups for the repeal of draconian laws such as the Armed Forces (Special Powers) Act (AFSPA) – which gives sweeping impunity to the armed forces of India operating in Kashmir – have been met with a cold shoulder, as the Indian army has staunchly opposed any attempts to repeal it. As Kashmir has seen a resurgence in violence, public support for the insurgency also seems to be increasing. India is losing whatever support it had among the general Kashmiri public, and this trend will continue unless it brings about a radical change in its Kashmir policy. During a November 2014 visit to Kashmir, discussions with locals revealed that Kashmiris point to the Indian government’s policies for the resurgence in violence. Many were of the opinion that India has not been honest in resolving the political problem of Kashmir. “India asked us to give up arms and come to the table, and we did it. What happened next? Nothing,” said one Kashmiri. “When the situation in Kashmir was bad during the ‘90s, India repeatedly said that dialogue is the way forward to the Kashmir problem and not violence. And now that India has strengthened its hold here, they say there is no political problem at all,” said another.